The United States said Tuesday it would send another 800 troops to South Korea as the allies warned North Korea against any provocation, amid deepening worries over the regime’s stability. 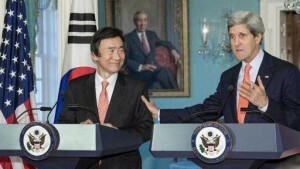 Amid concern after North Korean leader Kim Jong-Un executed his uncle, Secretary of State John Kerry met in Washington with South Korean Foreign minister Yun Byung-Se and said there was “not a sliver of daylight” between the two countries. “We will not accept North Korea as a nuclear state,” Kerry said at a joint press appearance with Yun, rejecting a top demand of the communist dynasty. “We remain fully committed to the defense of the Republic of Korea, including through extended deterrence and putting the full range of US military capabilities in place,” Kerry said, referring to the South by its formal name. “We will continue to modernise our capabilities so that we are prepared to face any threat,” Kerry said. The Pentagon said that the US Army would deploy another 800 soldiers, armored vehicles and tanks starting next month at camps Hovey and Stanley near the demarcation line with the North Korea. The rotational deployment from the 1st Battalion, 12th Cavalry Regiment is part of the US strategic shift toward the Asia-Pacific region “and allows for greater responsiveness to better meet theater operational requirements,” the Pentagon said in a statement. “This is a plus-up,” Warren told reporters. The “combat-ready” cavalry unit will serve a nine-month tour and leave behind its 40 Bradley armored fighting vehicles and 40 Abrams M1 tanks for troops that follow them, the Pentagon said. South Korea and the United States watched in dismay as North Korea took the unprecedented step of publicly announcing the execution of Jang Song-Thaek – young leader Kim’s uncle and former mentor – for an alleged plot. While the circumstances remain murky, North Korea observers were stunned by the admission of dissent within the totalitarian state – and voiced fear that the regime could try to renew unity by targeting the South. “In the event of any North Korean provocation, South Korea and the United States will firmly respond based on our robust combined defense posture,” Yun told reporters. “In addition to our actions, we will ensure that UN Security Council will take prompt measures which it deems necessary,” he said. Kerry voiced support for diplomatic efforts by South Korean President Park Geun-Hye, who has proposed a resumption of reunions of ageing families divided by the 1950-53 Korean War. Park, while warning of dangers from the North, also said Monday that South Korea would increase humanitarian aid to North Korea via international organisations. The fears of conflict come as basketball star Dennis Rodman pays a controversial visit to North Korea, where he will stage a game Wednesday to mark Kim’s birthday. Rodman has angrily rejected criticism of the trip, which comes as North Korea imprisons US missionary Kenneth Bae. The United States has said that Rodman is playing no official role.